Join the Savannah Waterfront Association and WSAV for an all American Fourth of July celebration on historic River Street! The annual River Street Fourth of July celebration and fireworks show will take place on Monday, July 4 from 4-10pm. The Savannah Waterfront Association is excited to help WSAV celebrate their 60th Anniversary at this year’s event. “At WSAV News 3 we are On Your Side and this year, we are celebrating 60 years of service to the Coastal empire and Lowcountry. Committed to providing families with the best in entertainment, live LOCAL news and sports, we are proud to partner with the Savannah Waterfront Association on the military stage and VIP fireworks viewing area as part of our Diamond Anniversary celebration,” said Deb Thompson, Vice President and General Manager at WSAV. VIP seating for viewing fireworks will be available for active and retired military and will be on a first come, first served basis. “The River Street Fourth of July Celebration is a Savannah tradition that everyone looks forward to and we are thrilled to partner with WSAV for this year’s celebration as we honor our military heroes. There will be plenty of activities for the entire family to enjoy including a festival kids zone, prize giveaways, and entertainment on the WSAV Military Stage,” said Emily Dickinson, President of the Savannah Waterfront Association. “We will also have The Hypnotics back again this year to perform from 8-10pm and will feature a patriotic set during the fireworks to compliment the show,” added Dickinson. The Wet Willie’s Fourth of July Fireworks, sponsored by Wet Willie’s Savannah, the City of Savannah, and Chatham County, will begin at 9:30pm. Guests are encouraged to park off of River Street since the SCMPD will close the street from 6pm-3am. 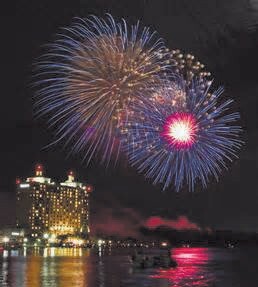 The River Street Fourth of July Celebration and Fireworks show is hosted by the Savannah Waterfront Association. For more information, go to riverstreetsavannah.com or call 912-234- 0295.